EVIDENCE THROUGHOUT THE WORLD SUGGESTS THAT A CONNECTION MAY EXIST BETWEEN ALIENS AND ANCIENT HUMAN CIVILIZATIONS. WHAT WE’RE DISCOVERING IS THAT ANCIENT SOCIETIES THA SUDDENLY BLOSSOMED AND BLOOMED OUT OF NOWHERE LEARNED THE INFORMATION FROM OLDER, MUCH OLDER CULTURES. NO CIVILIZATION IN HUMAN HISTORY MAY REVEAL MORE ABOUT OUR CONNECTION TO THE STARS THAN A RACE BEGINNING OVER 5,000 YEARS AGO. ANCIENT EGYPT IS ALMOST LIKE A WELL OF OUR OWN HUMAN PATHS.THE MORE WE EXPLORE THE MYSTERIES OF ANCIENT EGYPT, THE MONUMENTS, THE PYRAMIDS, THE SPHINX, THE MORE WE REALIZE THA THERE’S MORE TO LEARN ABOU ANCIENT EGYPT AND ITS POTENTIAL RELATIONSHIP TO OTHER EXTRATERRESTRIAL RACES. AMONG THE MANY RUINS HERE, THE GREAT TEMPLE OF HATHOR SERVES AS THE CENTRAL TEMPLE OF WORSHIP FOR THE GODDESS HATHOR, MOTHER, WIFE AND DAUGHTER OF RA, THE SUN GOD. WHAT’S FASCINATING ABOUT THE TEMPLE OF HATHOR IS THAT IT HAS THIS BEAUTIFUL CELESTIAL IMAGE ON THE CEILING. AND IT PROVES THAT THE ANCIENT EGYPTIANS WERE FASCINATED WITH ASTRONOMY. BUT HIEROGLYPHICS IN THE TEMPLE OF HATHOR ALSO REVEAL WHAT COULD BE A SCIENTIFIC UNDERSTANDING THOUSAND OF YEARS AHEAD OF ITS TIME. THE MOST MYSTERIOUS ETCHINGS APPEAR TO SHOW A DEVICE THAT WOULDN’T BE INVENTED BY MODERN MAN FOR ANOTHER THREE MILLENNIA. SO YOU HAVE THESE HIEROGLYPHICS THAT DEPICT THIS REPTILE-LIKE CREATURE OR CREATURES, GIVING THESE GIFTS TO HUMANS. AND THE GIFTS, REALLY, UPON LOOKING AT IT, ARE BULBOUS IN NATURE, THEY’RE EMITTING A LIGHT, YOU COULD EVEN ARGUE THAT THERE’S A FILAMENT INSIDE THAT LOOKS LIKE A LIGHT BULB. SOME PEOPLE SAY THAT IT’S A LIGHT BULB. DID ANCIENT EGYPTIANS POSSESSED THE KNOWLEDGE OF ELECTRIC LIGHT BULBS OVER 3,000 YEARS BEFORE THOMAS EDISON? AND CAN THE RECORDS OF ANCIENT EGYPT REVEAL THE TRUE IDENTITY OF THE STRANGE CREATURES PASSING THEIR KNOWLEDGE TO MANKIND? UNSEALED CASE FILE: THE TULLI PAPYRUS. ONE OF THE MOST RECENT ACCOUNTS OF POSSIBLE INTERACTION BETWEEN EGYPTIANS AND EXTRATERRESTRIALS COMES FROM THE TULLI PAPYRUS. ACCORDING TO REPORTS, THE TULLI PAPYRUS WAS DISCOVERED IN A CAIRO ANTIQUE SHOP BY ALBERTO TULLI, A DIRECTOR OF THE VATICAN MUSEUM’S EGYPTIAN STUDIES. THE MESSAGES’ ALLEGED TRANSLATION REVEALS A SHOCKING ACCOUNT OF UNIDENTIFIED VISITORS OVER THE SANDS OF ANCIENT EGYPT MORE THAN 3,500 YEARS AGO. IT READS: “IN THE YEAR 22, A STRANGE FIERY DISK WAS COMING IN THE SKY. AFTER SEVERAL DAYS HAD PASSED, THEY BECAME MORE NUMEROUS IN THE SKY THAN EVER. THEY SHINED IN THE SKY, MORE THAN THE BRIGHTNESS OF THE SUN. POWERFUL WAS THE POSITION OF THE FIERY DISKS. THE TULLI PAPYRUS DESCRIBES FIERY DISKS THAT WERE FLYING THROUGH THE SKY. WHAT DO WE CALL THESE NOW? WE CALL THESE UFOs, AND I ALMOST LOOKED LIKE AN ALIEN FLEET, THAT EXTRATERRESTRIALS WERE FLYING OVER THE SKIES OF ANCIENT EGYPT. MANY BELIEVE THESE FIERY DISKS COULD BE THE ARRIVAL OF ALIEN BEINGS DEPICTED IN THE TEMPLE OF HATHOR. IF THIS IS TRUE, THEN WE HAVE AN ACTUAL DOCUMENTED ACCOUNT OF UFOs DESCENDING UPON ANCIENT EGYPT. AND ON TOP OF THAT, WE COULD HAVE EVIDENCE OF TECHNOLOGY THOUSANDS OF YEARS AHEAD OF ITS TIME. IS IT POSSIBLE THAT WHAT WE THOUGHT OF AS GODS WERE IN FAC EXTRATERRESTRIALS THAT THE ANCIENT EGYPTIANS WERE COMMUNICATING WITH? AND IF SO, THEN WHY WERE THEY HERE? AND WHAT DID THEY WANT FROM US? COMING UP NEXT, THE ANSWER TO THESE MYSTERIES COULD REVEAL THE GREATEST ALIEN SECRETS IN HUMAN HISTORY AND UNCOVER THE TOMB OF AN ANCIENT RULER KNOWN TO SOME AS THE ALIEN KING. “UNSEALED: ALIEN FILES” EXPOSING THE BIGGEST SECRET ON PLANET EARTH. WELCOME BACK TO “UNSEALED: ALIEN FILES” ANCIENT EGYPTIAN RECORDS PROVE AN UNDENIABLE LINK BETWEEN THE PEOPLE OF EGYPT AND MYSTERIOUS BEINGS THAT HAVE BEEN INTERPRETED AS GODS. BUT WERE THESE GODS MERE FOLKLORE? OR COULD THEY HAVE BEEN ACTUAL CREATURES VISITING OUR PLANE AND SHARING THEIR SECRETS WITH MANKIND? IF THE ANCIENT EGYPTIANS HAD HAD CONTACT WITH EXTRATERRESTRIALS, MAYBE ALL OF THE HIEROGLYPHS THAT WE SEE TODAY OF THEIR GODS ARE ACTUALLY THEIR INTERACTIONS WITH EXTRATERRESTRIALS. CARVED INTO THE WALLS OF THE FAMED TEMPLE OF SETI ARE INCREDIBLE IMAGES THAT SOME BELIEVE COULD CONNECT ANCIEN MEN AND ALIEN LIFE. ON THE WALLS OF THESE EGYPTIAN EDIFICES, THERE SEEMED TO BE HIEROGLYPHIC DEPICTIONS OF AN AIRCRAFT. A MODERN TYPE OF AIRCRAFT. IT LOOKS LIKE THERE’S A SUBMARINE. IF THESE CARVINGS ARE EVIDENCE OF ALIEN CONTACT WITH ANCIENT HUMANS, WHAT WERE THEY HERE TO ACCOMPLISH? THE ANSWER COULD BE IN THE TOMB OF AN EGYPTIAN RULER SOME BELIEVE MAY NOT HAVE BEEN HUMAN AT ALL. UNSEALED CASE FILE: AKHENATEN, THE ALIEN KING. PHARAOH AMENHOTEP IV BECAME RULER OF EGYPT IN 1353 BC. BUT FIVE YEARS INTO HIS REIGN, HE CHANGED HIS NAME TO AKHENATEN, THE LIVING SPIRIT OF ATEN. IN EGYPTIAN MYTHOLOGY, ATEN IS DESCRIBED AS THIS SOLAR DISK, SOMETIMES DEPICTED WITH HANDS AND RAYS COMING OUT OF IT. AND THIS MAKES AKHENATEN THE LIVING EMBODIMENT OF THAT SUN DISK. ACCORDING TO THE KING, ATEN, THE SUN DISK, WAS MORE POWERFUL THAN MERE GODS. BECAUSE AKHENATEN WAS ABLE TO COME IN AND CHANGE ALL OF THE BELIEFS OF EGYPT IN A MATTER OF JUST YEARS, THAT TELLS ME THA THERE’S SOME CONNECTION BETWEEN HIM AND THIS DEITY. AND IF WE BELIEVE IN THE IDEA THAT ATEN WAS SOME SORT OF EXTRATERRESTRIAL BEING, THEN PERHAPS AKHENATEN WAS ACTUALLY OFFSPRING. HIEROGLYPHICS OF AKHENATEN REVEAL HIM TO BE ANYTHING BUT NORMAL. HIS ARMS AND FINGERS ARE LONG AND SLENDER. AND HIS HEAD, STRANGELY ELONGATED. CERTAIN CHARACTERISTICS OF THESE ALIENS WOULD BE PORTRAYED IN THE GENETIC STRUCTURE OF THE ROYAL FAMILY. AND ONE OF THOSE IS CRANIAL ELONGATION. ANALYSIS OF AKHENATEN’S SKULL HAS LED RESEARCHERS TO IMAGINE A HEAD OF INHUMAN LENGTH AND EYES OF UNUSUAL SIZE. THIS TRAIT WAS ALSO SEEN IN DAUGHTERS OF THE PHARAOH, AS WELL AS HIS FAMOUS SON, KING TUTANKHAMEN. BUT COULD THIS FAMILY HAVE DESCENDED FROM AN EXTRATERRESTRIAL RACE? 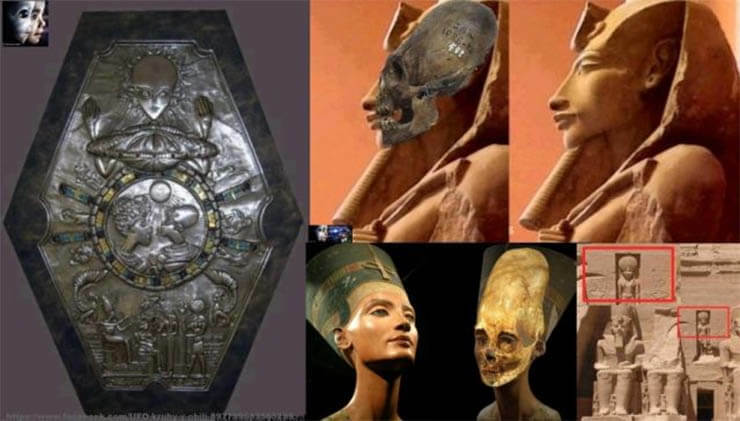 SKEPTICS BELIEVE THAT AKHENATEN’S SKULL SHAPE COULD BE THE RESULT OF SKULL BINDING OR TYING SOMETHING AROUND THE HEAD TO MISSHAPE IT ON PURPOSE, BU THERE’S ABSOLUTELY NO EVIDENCE THAT SUPPORTS THAT AKHENATEN’S SKULL SHAPE HAS ANYTHING TO DO WITH SKULL BINDING. SOME CLAIM AKHENATEN AND HIS DESCENDANTS SUFFERED FROM A BIOLOGICAL DISORDER, BUT ALIEN THEORISTS INSIST THE EXPLANATION LIES IN SOMETHING FAR MORE SHOCKING. COULD AKHENATEN, IN FACT, HAVE BEEN THE FIRST RECORDED ATTEMPT AT ALIEN HUMAN HYBRIDIZATION? IF AN ALIEN RACE WERE DYING, HOW WOULD THEY INVADE ANOTHER PLANET TO SUSTAIN THEIR RACE, TO KEEP THEMSELVES ALIVE THROUGH SUCCESSIVE GENERATIONS? ONE WAY WOULD BE TO HYBRIDIZE WITH THAT SPECIES, TO CREATE A NEW SPECIES, THE SYNTHESIS OF THAT SPECIES AND THEIR OWN. AND THEREFORE, THEIR CIVILIZATION COULD BE SUSTAINED. IF ALIENS WERE SUCCESSFUL IN INTERBREEDING WITH HUMANS, THEIR GENES COULD STILL BE PRESENT IN THE HUMAN RACE TODAY. BUT WHERE DID THEY COME FROM? AND WHERE DID THEY GO? THE ANSWER MAY BE WITHIN MESSAGES LEFT BEHIND AT THEIR GREATEST ACHIEVEMENTS: THE PYRAMIDS. COMING UP NEXT, THE HIDDEN CODES OF THE PYRAMID REVEAL INCREDIBLE EVIDENCE OF ALIEN ARCHITECTS AND EXPOSE A SHOCKING SECRET THA COULD CHANGE EVERYTHING WE’VE EVER BELIEVED ABOUT THE ORIGINS OF MAN. THIS IS “UNSEALED: ALIEN FILES” EXPOSING THE BIGGEST SECRET ON PLANET EARTH. WELCOME BACK TO “UNSEALED: ALIEN FILES” ANCIENT RECORDS AND THE REMAINS OF A PHARAOH KNOWN AS THE ALIEN KING MAY PROVE THAT THE GODS OF EGYPT WERE MORE FLESH AND BLOOD THAN EVER IMAGINED. BUT COULD THESE STRANGE BEINGS HAVE BEEN VISITORS FROM ANOTHER WORLD? A LOT OF BELIEVERS FEEL THA THAT IS EVIDENCE THAT THEY WERE VISITED. THAT IS EVIDENCE THAT THEY KNEW MORE THEN THAN WE KNOW NOW ABOU LIFE OUT THERE IN THE UNIVERSE. THE PYRAMIDS, WHAT MANY WOULD CALL IMPOSSIBLE STRUCTURES. THE PYRAMIDS MAY BE MAN’S GREATEST EARLY FEATS OF ENGINEERING. BUT WAS THE FEAT ACCOMPLISHED BY MANKIND ALONE? YOU CAN SEE EXAMPLES OF THIS ALL OVER THE GLOBE, BUT THE MOS IMPRESSIVE AND FASCINATING IS THE GREAT PYRAMID OF GIZA. THE GREAT PYRAMID OF GIZA WAS PARTIALLY CONSTRUCTED USING 130 GRANITE BLOCKS THAT EACH WEIGHED BETWEEN 12 AND 70 TONS. EACH MASSIVE PIECE WAS NEARLY IMPOSSIBLE TO MOVE WITH SHEER MANPOWER ALONE. AND YET, EACH ONE WAS TRANSPORTED INCREDIBLE DISTANCES. THESE LARGE STONES OF GRANITE WERE HAULED 500 MILES AWAY TO BUILD THE GREAT PYRAMIDS OF EGYPT. THEY NEEDED TO BE HOISTED OVER TIME THEY REACHED THEIR CAPSTONE, SO HOW DID ANY RACE DO THIS AND ACCOMPLISH THIS? ESPECIALLY WHEN THEY CAME 2,000, OF JESUS. ACCORDING TO HISTORIANS, THE GREAT PYRAMID TOOK ONLY 20 YEARS TO CONSTRUCT. IF TRUE, WORKERS WOULD HAVE HAD TO QUARRY, CRAFT AND FIT A MULTI-TON BLOCK EVERY 2 1/2 MINUTES. THAT’S AN AMAZING FEAT, EVEN WHEN YOU’RE TALKING ABOUT 21S CENTURY TECHNOLOGY. SO HOW DID THE ANCIEN EGYPTIANS DO IT? REALLY, THE ONLY ANSWER TO THA THAT YOU CAN COME UP WITH THA MAKES SENSE TODAY IS THEY HAD HELP. THEY HAD TO HAVE HAD HELP. HOW COULD THE HUMAN RACE DO THIS BY THEMSELVES? THE DEGREE OF ACCURACY FOUND IN THE PYRAMIDS’ CONSTRUCTION ALSO INDICATES A HIGHER INTELLIGENCE. THE POSITIONING OF THE PYRAMID IS ABSOLUTELY PRECISE. IT POINTS DUE NORTH WITHIN 500s OF A DEGREE. NO OTHER STRUCTURE ON EARTH HAS THAT KIND OF PRECISION. CONSTRUCTED WITH WHAT THE EGYPTIANS REFERRED TO AS SACRED GEOMETRY, THE PYRAMIDS ARE SAID TO HAVE ONCE BEEN POLISHED TO REFLECT SUNLIGHT ENOUGH TO BE VISIBLE FROM SPACE. BUT WHAT WAS THE PURPOSE OF SUCH A BEACON? AND COULD THE ANSWER BE BURIED WITHIN THIS SACRED GEOMETRY? THE EQUATIONS AND THE MATHEMATICS REQUIRED TO HAVE FIGURED THAT OUT WERE SO ADVANCED, THAT ONLY SOMEONE LOOKING AT THE EARTH FROM THE SKY OR FROM SPACE WOULD HAVE FIGURED OUT THE MATHEMATICS FOR THE EQUATION. ANALYSIS INDICATES THAT THE HEIGHT OF THE GREAT PYRAMID, WHEN MULTIPLIED BY ONE BILLION, MEASURES THE AVERAGE DISTANCE OF THE EARTH FROM THE SUN. THE FULL BASE CIRCUMFERENCE OF THE GREAT PYRAMID IS A NEAR TO SCALE MATCH FOR THE CIRCUMFERENCE OF THE EARTH A THE EQUATOR. WHEN YOU TAKE ALL THIS INTO CONSIDERATION, HOW DID THE EGYPTIANS GET ALL THIS ADVANCED INFORMATION? IT WAS WAY BEYOND THE TECHNOLOGY OF ANCIENT EGYPT AND WAY BEYOND CIVILIZATION ITSELF. THAT’S WHY MANY ANCIENT ALIEN THEORISTS BELIEVE THAT ANCIENT EGYPT WAS ACTUALLY, IN PART, AN ANCIENT EXTRATERRESTRIAL CIVILIZATION. IF EXTRATERRESTRIAL INTELLIGENCE INFLUENCED THESE GREAT STRUCTURES, IT IMPLIES THAT ALIEN BEINGS MAY HAVE FELT A KINSHIP WITH MANKIND. OTHERWISE, WHY DID THEY LEAVE BEHIND THE GREAT PYRAMID OR THE STRUCTURE THAT COULD EXPLAIN TO US WHERE THEY CAME FROM? THE SPHINX. AT 66 FEET HIGH AND 240 FEET IN LENGTH, IT IS THE LARGEST MONOLITH STATUE IN THE WORLD. AND WITHIN IT, IS A SECRET THAT MAY PROVE THAT THE STRUCTURES OF ANCIENT EGYPT DID NOT ORIGINATE FROM OUR PLANET. THE GREAT SPHINX CONTAINS A NUMBER OF MYSTERIES BEYOND OUR UNDERSTANDING, BUT THE GREATEST OF WHICH IS RIGHT ON ITS SURFACE. THEN THAT MEANS THAT THE SPHINX WOULD PREDATE THE EGYPTIAN CULTURE BY THOUSANDS OF YEARS. IF THE EGYPTIANS DIDN’T BUILD THE SPHINX, THEN WHO OR WHA DID? COMING UP NEXT, A CHILLING POSSIBILITY IS REVEALED BY NASA. THESE GREAT STRUCTURES MAY NO BE FROM EARTH AT ALL. AND THE PHOTOGRAPHS THAT COULD PROVE IT WILL SHOCK THE WORLD WHEN WE RETURN. WELCOME BACK TO “UNSEALED: ALIEN FILES”.